When we had a little chick hatch from one of our eggs this fall, she was so sweet and won over my heart instantly. I worked so hard to keep that little chick alive. The broody hen who hatched her seemed to lose interest after a few weeks so little Sweet Pea was left to fend for herself. For a week or so I went looking for mamma when the birds came in to roost and I’d get her down from the rafters with a rake and put her in a dog cage with the baby so Sweet Pea wouldn’t get too cold. When Sweet Pea learned to roost with the big birds I stopped forcing mom to stay with her. Watching my little chick I noticed she was having trouble getting in to eat and drink because the big girls packed in around the feeders and blocked the way. I built a little space in the corner of the coop out of 2×4 welded wire. In it, I put a feeder with some crumble feed and water. Sweet Pea could fit through the openings in the wire but the fully grown birds couldn’t. It worked well and she started to grow fast. And so, my husband was right. We have a rooster again. 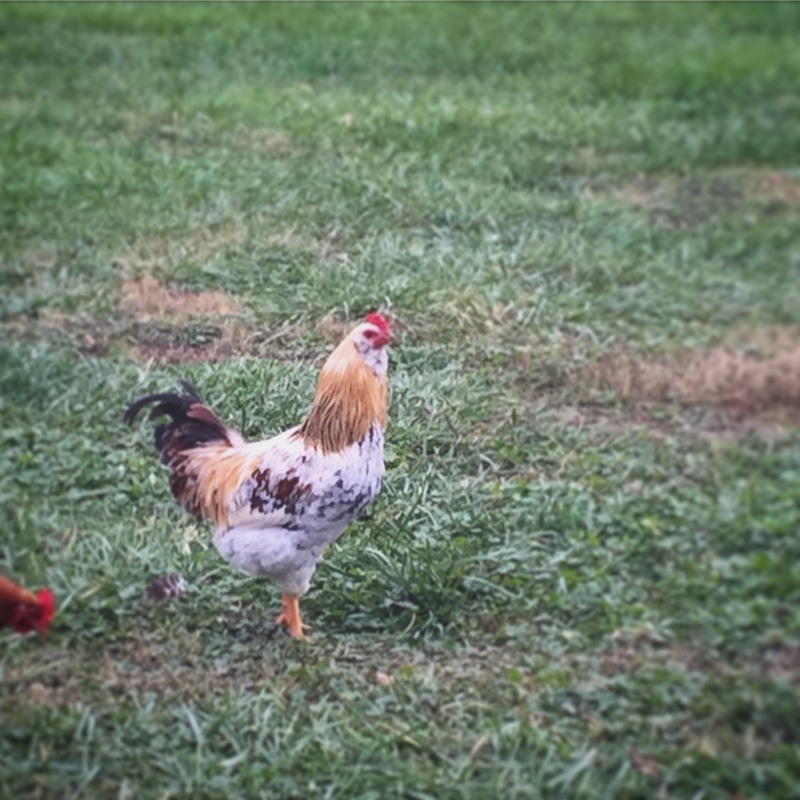 I have a rooster we call runt. We incubated a batch of eggs and against what everyone says when he got stuck in the egg I helped him out. I hand fed him for a few weeks and he imprinted on me. Now he is full grown with one inch Spurs and every time he sees me he starts crowing. When I visit him he lowers one wing and does a circle dance around me until I pick him up and hold him a while.